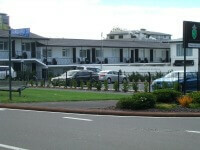 You know, luxury accommodation in Rotorua is not only for the wealthy. For example, you might have something special to celebrate. Wedding bells anyone? Anniversary? What about that gathering - family, old friends - you've been thinking about for ages? Either way, we've got you with this collection featuring back to nature, old world charm, contemporary elegance and rustically rural - yehaa (I can see it now). Treetops (as I call it) is a hidden treasure located about 20mins out of Rotorua city. High-end luxury is the name of the game with no detail left out. The accommodation ranges from lodge rooms with shared living space to secluded villas and retreats found elsewhere on the 2,500 acres of this property. It's a perfect location for weddings and other events, business meetings and your un-average holiday. A good idea would be to take advantage of the packages. Wild Food & Wine, Wild Food Cooking, Fly Fishing & Fun, 5-star Children's packages (these look so good) and Wedding & Honeymoon packages to name just a few. Hunters and fishermen are not forgotten either as packages catering specifically to their needs are available. That's them there 'manly' packages. Vegetable gardens and all sorts of native animals can be found not too far from the lodge. Horses too. The kiddies would thoroughly enjoy visiting this area. Never mind the kids, this is a self-contained world where every need and want is met. Enough said. Find the best deal for Treetops Lodge & Estate on TripAdvisor. Princes Gate is a world away from hunting and fishing. Yes, indeedy! One does not get ones hands dirty (in that way) in a place that is personified as luxurious elegance and old-world charm - does one? The charm extends to sampling the High Tea where you wouldn't be at all surprised to see Scarlett O'Hara, of Gone With The Wind fame, imperiously swish into the room commanding all men, by her mere presence, to fall at her feet. How did she do that? And this, would be her place of choice to stay. These days, Princes Gate has all the conveniences any modern girl (or man) could want. Take in a show with the onsite Cabaret, play a game of tennis or make good use of the private thermal pool. Great for romantic getaways, school holidays for the family, wedding and business events. Even the jaded corporate traveller would love resting up here. As well as being centrally located, it's close to the Government Gardens, Polynesian Spa, the Lakefront, restaurants and shopping. You wouldn't need much else. Compare prices and read what other travelers have to say. 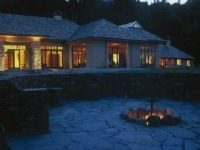 Located on a private peninsula overlooking Lake Tarawera, Solitaire Lodge is another luxurious back to nature retreat. Initially Solitaire was set up as a Luxury Fishing Lodge by Reg Turner back in 1980. 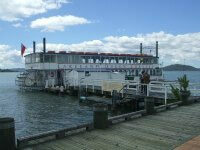 At that time it was a big deal as there was nothing like it anywhere else in New Zealand. For a lot of locals it has always carried an air of mystery. That's where the rich people went to holiday. I would have to say that some of that mystique has carried over to the present time. Feeling very lucky to own this property are your hosts, Wayne Tomlinson and Ingrid Jaques. 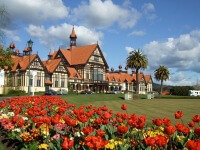 Although not from Rotorua originally (they are kiwis though), Wayne and Ingrid both fell in love with this magical place. Quite understandable really. What's not to love? Secluded bays and waterfalls. Across the lake our famous volcano, Mt Tarawera. Hot water beaches, yes the geothermal waters bubble up through the sand in the lake. You've got to try it but watch out for hot feet. There's trout fishing… of course, kayaking, a pontoon, etc. Need I say more? You can take your trout to a hot water beach and cook it in the sand as locals do. Speaking to Wayne about Solitaire's restaurant, he said that more locals are using it for special occasions such as reunions, significant birthdays, taking their visitors along etc. What's interesting is that they are pleasantly surprised at how reasonable the prices are. Fine dining, premium NZ wines and spectacular views, what could be more perfect? The restaurant isn't the only place with spectacular views though. Solitaire has 10 luxury suites with panoramic views of Lake Tarawera. I can just imagine how peaceful it would be to sleep there at night. Solitaire also offers packages. How does a helicopter flight at twilight sound? Or maybe a guided bike ride through the Redwood forest. That's just two of what they have on offer. All in all, another lovely way to rejuvenate. Here we go with another inner city alternative. Although I've only had breakfast at the Regent, which was top notch by the way, judging by the raving testimonials on Trip Advisor and the fact that the Regent is winning Travellers' Choice awards and food awards, it would definitely have to rate as a great place to stay and dine at. From humble beginnings as an ordinary motel it has been turned into one class act. 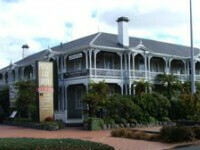 Definitely deserving of being in the luxury accommodation category for Rotorua. Everything looks smart, contemporary and very stylish. Glamorous is the word used on the Regent's website and glamorous is what it is. If you want to stay in the inner city, close to the restaurants, the lake front and just about everything, then this is the place for you. Apart from rooms and apartments there is a swimming pool, a thermal pool, spa treatment area, a little gym and a restaurant and cocktail bar. The decor in the Regent restaurant and cocktail bar is black and white. For me it recalls memories of old Hollywood glamour with a modern contemporary twist. I half expect to see Humphrey Bogart propped up at the bar, cigarette smoke curling lazily into the air. He wouldn't look out of place that's for sure. This property would lend itself to being named The Eyrie. But maybe that’s a bit too obvious. 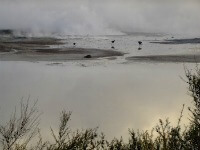 Located as it is, high above the southern end of the city, the spectacular views swoop across Rotorua from the sun rising in the east to its setting in the west. In the winter, that means the sun streams in - all day. I know! Tihiotonga itself is a quiet residential area that we considered quite posh when I was growing up. Now it’s a blend of faded elegance and upmarket modern which is what this property is (I remember it being built not too long ago). 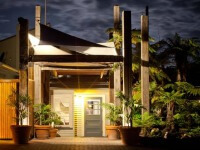 Architecturally designed, the Tihi Retreat epitomises luxury. Mod cons? What hasn’t it got? Nearby you will find mountain biking, the Pohutu Geyser at Te Puia and Whakarewarewa - The Living Māori Village. Centennial Park is a short stroll down the hill if you need even more of a reason to relax and the Arikapakapa Rotorua Golf Club is at the foot of Tihiotonga. A 10min, 5.2km drive will have you in the central city. With a 4.5km, 8min drive into the city cenre, you can still escape the rat race of Rotorua (as if) when staying at this lakeside property. The Black Swan, - because, black swans, in the lake - is a stylish boutique hotel with a decor along the lines of the Regent but in a lovely vivid blue. The best feature would be the setting. Although it’s in a well-established residential area, the property is still secluded. Large grounds (1 acre) include a heated swimming pool, rose gardens, grotto, sauna, heli-pad (see, helicopters - tapping my nose here) and private jetty. The onsite Day Spa is a great favourite. Massage Therapies, Body Treatments, Facials and Packages. You can be waxed and tinted to your hearts delight (more like spasming with the pain of it I would think but hey, what would I know). Throw in a High Tea, taster platters or light meals, a wine or two, what could be more perfect. Ahh! Yes, the word is that we're set to get ourselves a luxury 7 star hotel. Stay tuned, all will be revealed.